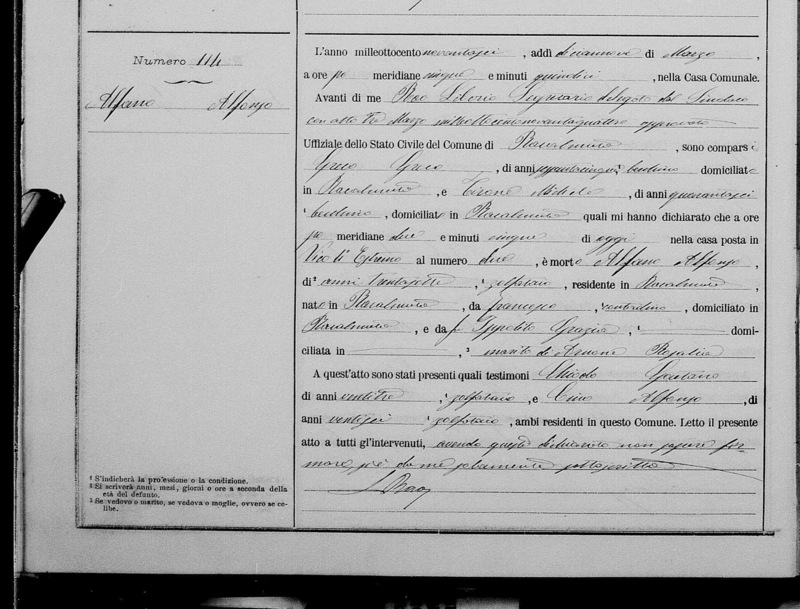 For a long time, I regret to say, I avoided Italian records in my genealogy research. This, even though I proudly claim 50% Italian heritage and my husband, 100%. I had successfully found passenger records for my great-grandparents and his, naming their towns of origin, but I stopped there. You see, I made some pretty big assumptions about Italian records, which to my pleasant surprise, turned out to be absolutely false. First, I assumed that even if I could find Italian records pertaining to my ancestors, I wouldn’t be able to understand them. At the time, I didn’t speak Italian. However, when I finally started looking at Italian records, I realized that they generally follow a template, sort of like a form letter, where the recorder would “fill in the blanks” so to speak. So once you understand what the template says (which you can learn through any good Italian genealogy book, the FamilySearch Wiki or even Google Translate), you really only need to be familiar with a few words and symbols . . . and maybe a few nuances of Italian script. Ironically, not too long after I began delving into Italian records, we received orders to Vicenza. I gained a much firmer grasp of the language and furthered my Italian genealogical education while living there for three years. Besides doubting my ability to understand the records, I also doubted the records themselves. I assumed Italian records would be, well, a mess. Listen, I love Italy. Like I seriously LOVE it. But, as Rick Steve’s describes it, it can sometimes feel a little “intense” to outsiders (especially in the South, where all my ancestors originated): Helmet-less people on scooters weaving in and out of traffic, roadways that seem to be patterned after a bowl of spaghetti, less than dependable train schedules and a reputation for government corruption and bloated bureaucracy. I could attest to some of these things as a former tourist, so I assumed that Italian records could only be equally “chaotic.” Well, nothing could be further from the truth. As it turns out, Italian records are, generally speaking, WAY clearer than American records. Now, I both love the Italian culture for its chaotic vivacity and Italian records for their organization and clarity. 1. They go back really far. . . I mean really, really far! Just this week, I conducted some microfilm searches for a client in Italy (hence, the inspiration for this post). I was looking at Tuscan records that dated back to 1750! How cool is it that I get to investigate something THAT old from a part of the world so dear to my heart? But you know what? In terms of Italian records, 1750 that isn’t that old. Trafford R. Cole wrote in his book, Italian Genealogical Records, “Each town in Italy has civil records dating back to at least 1870, some dating back to 1809. The Catholic parishes situated in every village and town have records from much earlier periods. Most parishes have records dating back to 1595 or at least to the beginning of the parish. . . . Other sources exist also: university records can date back to the 1200s. . . .”  See what I mean? 2. Civil records were standardized in the Napoleonic Era. With Napoleon’s unification of Italy in the early 1800s the government hierarchy became organized into local, provincial and regional units. The local unit shouldered the responsibility of recording vital statistics. Napoleon specifically mandated exactly what information should be recorded and how. He even supplied local governments with standardized books (what I referred to earlier as a “template”) to aid in the record keeping. Even after Napoleon’s defeat, many local municipalities continued to follow the method he implemented . 3. Italian records share a lot of detail. 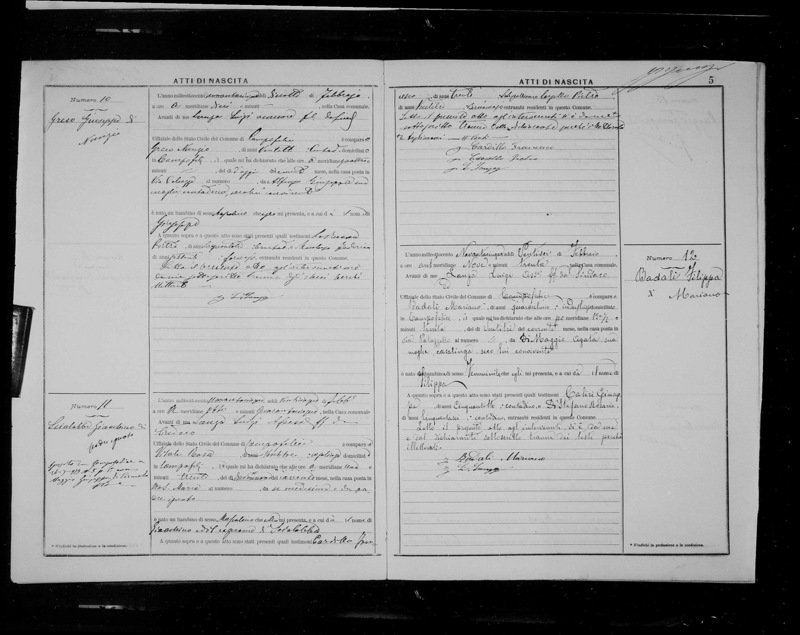 For example, the death record above names the age, occupation, birthplace, town of residence and address of the deceased. It names his parents (indicating his mother is deceased), his father’s occupation and residence, and his wife’s name. It also gives the informants’ names and occupations. With details like these, you can take your family tree back generations in no time (of course, always do a reasonably exhaustive before taking any record at face value). 4. Italian women don’t change their surname. Any genealogist who has ever lost track of a female ancestor thanks to an unknown marriage/name change knows what a big deal this is. If you haven’t, I am telling you, genealogy is SO much easier when married women keep their maiden name. 5. The people in Italian Records tended to stay put for generations. One thing many Americans (myself included before I moved to Italy) do not understand about Italy is that the country is very regionally oriented. Most Italians consider themselves of their region before they consider themselves Italian. The food, dialect and culture varies greatly from region to region. This is in part thanks to the geography and topography of Italy which lends itself to regional autonomy. Along with the majority population’s dependence on agricultural livelihood, this means that many families lived on the same plot of land, or at least in the same general area, for generations and generations  . 6. Many Italian Records are indexed, by the same people who kept them. It is easy to think of record indexing as a modern-day product of Ancestry or FamilySearch which allows me to search for my ancestor by name in a database. Well, Italian records often have very clear, easy to follow indexes within the records themselves. So even if Ancestry or FamilySearch hasn’t gotten around to indexing the record set you are looking through, you don’t have to look at each record individually. You can start by consulting the index (usually at the very beginning or end of the record set), saving tons of time and energy. 7. Dates are often written out in word form. Though it may not seem like a big deal, dates written in word form save a lot of confusion and second-guessing. There is no wondering if that 6 was actually a 5 or forgetting that in Europe the numeric date comes before the month, etc. So, do you have Italian ancestry? If yes, don’t be afraid of Italian records! Find the town from which your ancestor originated and begin searching. 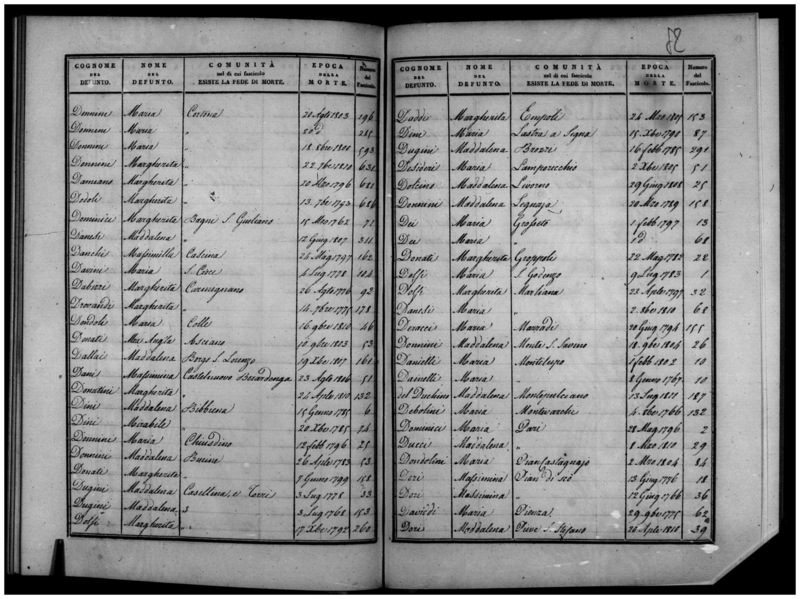 FamilySearch has many Italian records available online and many more available on microfilm. If you are unsure of the exact locale your ancestor called home, there are many reliable ways to find out more. I am tempted to get into some of those methods now, but I think I will save them for another post. “Naples and Pompeii,” Rick Steves Europe Website, Video Script, bullet 3, (RickSteves.com : Accessed 5 Nov 2015). Trafford R. Cole, Italian Genealogical Records: How to Use Italian Civil, Ecclesiastical & Other Records in Family History Research (Salt Lake City, Utah: Ancestry, 1995), 7-8. Cole, Italian Genealogical Records, 6. Love this post! I agree that the depth of information found in Italian sources is invaluable. I just wish that more were searchable online, especially for those of us who only get to Italy sporadically. I agree that it would be great if more were searchable online! I have a birth record with an odd twist. The child is written as DiSanti Antonio (no surprise there), with the father as Di Santi Vincenzo Giuseppe (Is his first name Vincenzo)? Here’s where it gets odd. The mother is DeFilippo Maria Giuseppe (an E, not an O, so it can’t be her middle name). So it’s confusing because why would she have A) the same name as her husband, but not his last name, and B) a man’s name that is the same as her middle name. All I could think of is that they are cousins and this is a maternal name. Got any ideas? I meant not an “a” for Giuseppa. Hey there. Thanks for you question! Italian women, even today, keep their maiden name and do not take their husbands’ surname. Makes genealogy research SO much easier! As to the Giuseppe parts of the name, I do not think they are “middle” names. Rather, it was common in some parts of Italy for individuals to have double surnames to distinguish between other nearby families with the same surname. So in this case, perhaps there were a number of both DeFilippo and Di Santi families in the town. The “Giuseppe” part would tell WHICH DeFillipo family and WHICh Di Santi family. It is like how we might say something today like the “John Smith” family, not the “Joe Smith” family. If I may ask, from what part of Italy did your ancestors hail?